Who else besides Hello Kitty is five apples tall and has no mouth? The Japanese Sanrio character has stolen the hearts of generations across the globe since its debut a few decades ago, and today, Hello Kitty is a world-famous icon and very well-loved. Cutesy Hello Kitty-themed cafes are already sprouting across Asia, with another kawaii Hello Kitty-themed cafe set to open in Singapore Changi Airport next month. Evidently, the world just cannot seem to get enough of this Japanese cat with no mouth. If you thought that the restaurant industry would halt at just Hello Kitty cakes and coffees, you are absolutely wrong. Hello Kitty Chinese Cuisine, the World’s Very First Hello Kitty-Themed Dim Sum Restaurant has taken Hong Kong by storm and is a must-visit for all avid fans. It has been about a year since Hello Kitty Chinese Cuisine first opened its doors but till date, the Hong Kong restaurant faces no lack of eager patrons. It’s like the novelty of Hello Kitty Dim Sums never worn off. Hello Kitty Chinese Cuisine’s diverse clientele consists of an interesting mix of locals, Western expatriates, Japanese tourists, screaming toddlers and young couples from all over the world. While everyone comes from a vastly different background, they are all dining at the restaurant for the same reason: the love for Hello Kitty. No expense has been spared to ensure that every single item – edible or non-edible – at Hello Kitty Chinese Cuisine is imprinted with Hello Kitty’s face, iconic bow or its silhouette. From dim sums, wet tissue packets, teacups, teapots, chairs, windows to even ceiling lamps, you are completely surrounded by the cuteness. Hello Kitty Chinese Cuisine is undoubtedly a media darling. However, we have to be honest with you that Hello Kitty Chinese Cuisine – despite its global hype – is not a gourmet destination, but a go-to place to fulfil one’s Hello Kitty fantasies. When the steamed baskets of Hello Kitty dim sums were presented to us, we were squirming in delight – how could anything look so damn adorable? We almost couldn’t bear to eat them. Har Gow (HK$68) and Liu Sha Bao (HK$62) are Hello Kitty Chinese Cuisine’s bestselling dim sums. The former comes in a steamed basket of four dainty shrimp dumplings, while the latter comprises three delicate custard buns stuffed with molten salted egg yolk. Well, they may be signature dishes and tasted decent, but don’t expect anything out of the world. And don’t be too carried away with taking photos that you forget about your buns! The molten salted egg yolk will harden if left for too long. While many lament about Hello Kitty Chinese Cuisine’s exorbitant prices, customers have to acknowledge the extreme efforts taken to craft these Kitty-themed treats. In fact, chefs take about 17 more steps (compared to traditional dim sums) to make these Kitty delights. Well, as the saying goes, time is money. Man Kwong – the founder of Hello Kitty Chinese Cuisine – is an advocate of healthy eating, hence only locally grown organic ingredients and all-natural dyes are used in this family-friendly restaurant. The Kitty dim sum’s eyes and whiskers have been dyed black with squid ink, while her pretty bow is coloured pink with beetroot, and minuscule nose dotted yellow with carrot. 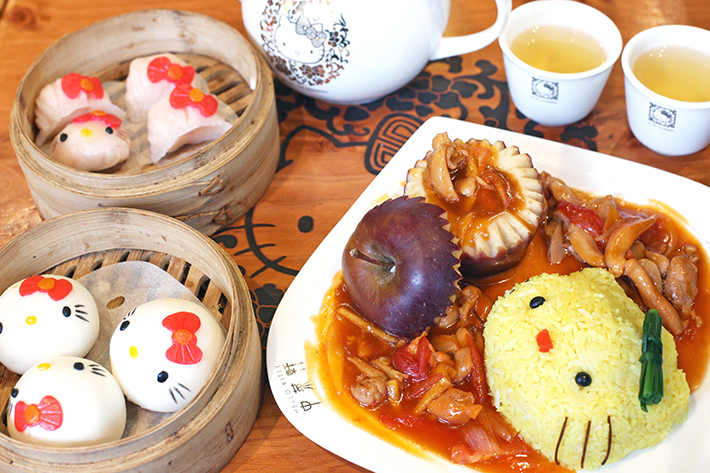 For something more substantial, order the Hello Kitty Red Apple Chicken Rice (HK$108). The main course is essentially a hearty portion of saffron fried rice complemented with a myriad of organic vegetables and shredded chicken in scrumptious apple sauce. Needless to say, the Instagram-worthy food is a huge draw and we see everyone snapping away endlessly. Due to Hello Kitty Chinese Cuisine’s overwhelming popularity, we strongly recommend you to make a reservation in advance to secure a table. Remember those adorable Gudetama dumplings with molten centers that everyone was posting photos and videos of on social media? Well, to kickstart the new year, Dim Sum Icon has changed its Gudetama concept to a Little Twin Stars one with adorable dim sum items.